In the French port town of Calais, the historic home of the lace industry, a city within a city has arisen. This new town, known as the Jungle, is the home of thousands of refugees, mainly from the Middle East and Africa, all hoping, somehow, to get to the UK. Into this squalid shantytown of shipping containers and tents, full of rats and trash and devoid of toilets and safety, the artist Kate Evans brought a sketchbook and an open mind. Combining the techniques of eyewitness reportage with the medium of comic-book storytelling, Evans has produced this unforgettable book, filled with poignant images by turns shocking, angering, wry, and heartbreaking. 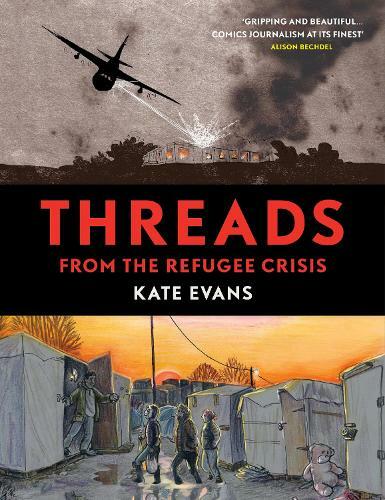 Weaving into the story hostile comments about the migrants from nativist politicians and Internet trolls, Threads addresses one of the most pressing issues of modern times making a compelling case, through intimate evidence, for compassionate treatment of refugees and the free movement of peoples. Evans's creativity and passion as an artist, activist, and mother shine through.